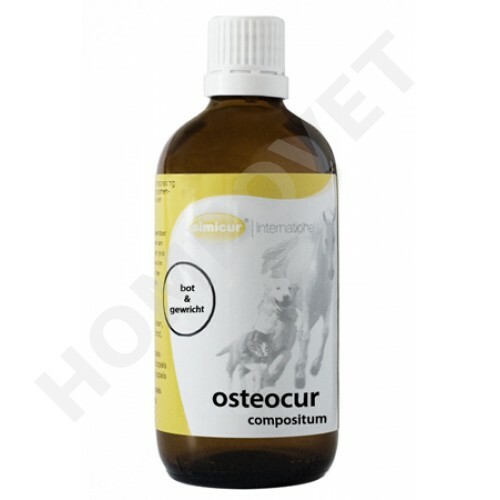 Osteocur is a homeopathic tincture in a 100 ml dropper bottle of SIMICUR for oral use in dogs, cats, horses and ponies. Effect: overloading, poor condition and a poor metabolism can cause the emergence of a different structure in one or more bones. By regulating effect on the blood flow in the bones and the calcium metabolism, Osteocur has a postitive effect on the bone structure. Symphytum has a mitigating and analgesic effect and improves blood circulation. Improved blood flow to the bone feed is also provided by Viscum that stimulates the blood supply to the bone. The restoration of the bone is promoted by Arnica, which is supported by Calcarea.